In 1970, you could get any number of compact sports cars that were based on designs and platforms from the 50s and 60s – look at any product from Triumph or MG, and while Fiat and Alfa were definitely more modern, the basic twin-cam 4/live rear axle roadster setup had its roots firmly in earlier cars. Even though those are fun machines in their own right, it was only later in the 1970s that automakers started releasing truly modern sports cars like the Fiat X1/9 and Triumph TR7. 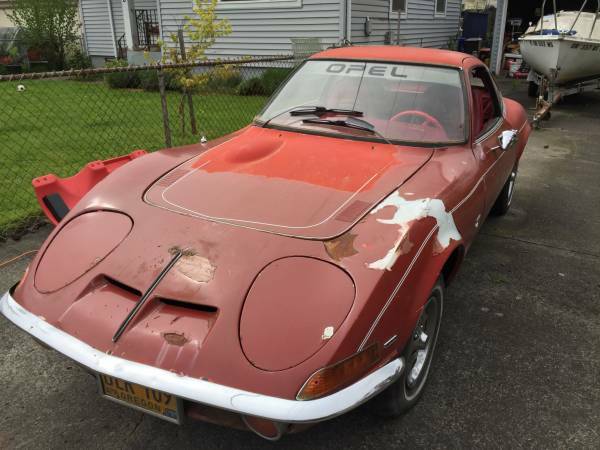 But while the concept of the Opel GT dated back to the early 1960s, the actual car came out in 1968. 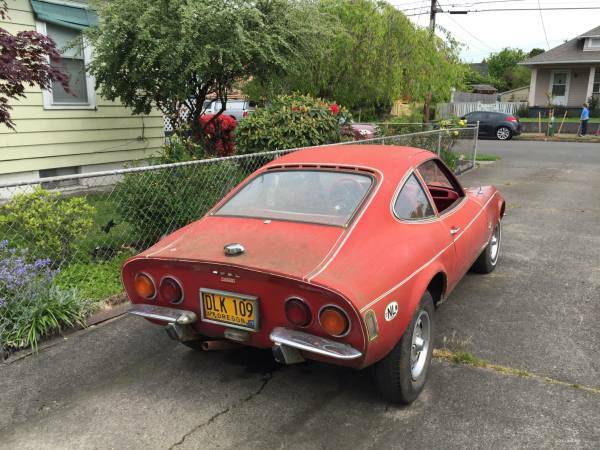 Check out this 1970 Opel GT for sale for $2500 in Portland, OR. First of all, something about the angle of this photograph is making those headlight covers look massive – nearly as big as the wheels, which is a lot of surface area on a car the size of a Fiat X1/9. Speaking of the nose, the nostrils seem to be emphasized by what looks like a bit of aftermarket rub strip in between them and a deleted Opel emblem. The rear shows only a single small tailpipe – it would probably be worth upgrading or returning to dual outlets. The blue/yellow plates and stickers suggest longtime ownership by a Dutch Oregonian. Pin-striping is very 1970s and can probably be removed while you’re rubbing out the paint to get the last ounce of shine out of it. The interior is surprisingly clean, complete, and undamaged, not always a given on GTs at this end of the market. 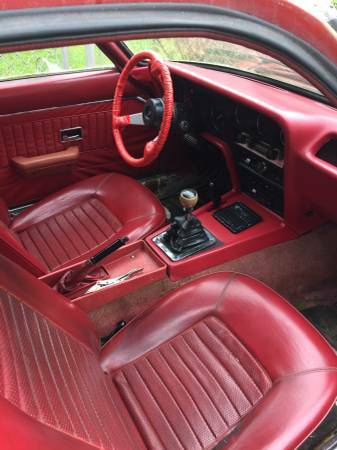 You’ll want to ask the seller about the vise-grips on the center console, just to be sure they’re not there for some kind of permanent issue. This interior actually looks great in all-red, and doesn’t have the bordello effect of larger cars with red interiors. It is said to need new carpet, so with any luck kits are available from one of the German vendors. Unfortunately, the engine is not pictured, but the claimed 76,000 miles align with the interior condition. It’s said to start and run well, brakes and clutch are good, and windows functional. Evidently the reverse light and brake light need attention, but everything else is said to work. The seller is expecting a new baby next month, so with August starting in only a few days, your bargaining position should be strong. Show up with cash-in-hand and a willing enabler partner to drive your car back, and you’ll have a new project! This entry was posted on July 29, 2015 at 11:14 am and is filed under Feature. You can follow any responses to this entry through the RSS 2.0 feed. You can leave a response, or trackback from your own site. That’s my car! Great write up. The car is still for sale as of August 6. Come and get it she’s all ready for a light restoration and then to be driven. Very cool car but my E30 M3 deserves more of my time.